The Underwoods started Thanksgiving Day off with a cool run. Blake and Hunter are in the front here with red head bands and black shirts. Dave is in the crowd behind Hunter. Dave and Hunter finish their first Mile. They opted for the two mile run. 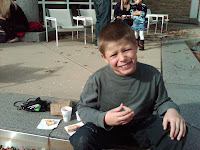 Blake finished his five mile with a smile. 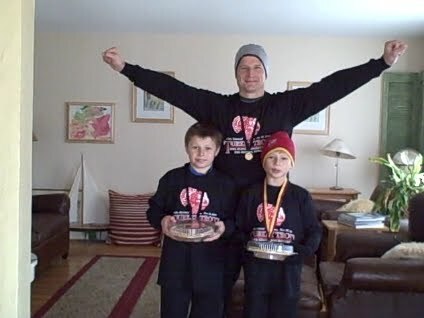 Team Underwood finished with the following: Dave - 4th place in the 2 mile 40-49 year male. Hunter - 10th place in the 2 mile 13 and under male. 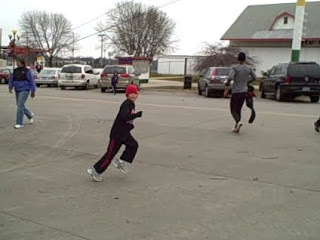 Blake - 2nd place in the 5 mile 13 and under male. We won two pies and three medals. Dave got out of making dessert this year. Where is Amy? Saving up her energy. The first mall opens at midnight! 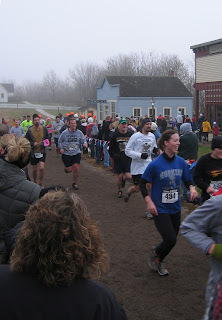 So I (Adam)finished off the running season with the exciting Living History Farms Cross Country Race (though the season isn't done, but what is a running season anyway, stay tuned for the big one coming up). It has been over 20 years since I last ran this race and it has changed a lot. This time I wasn't a high school cross country runner with the flu. Also, I vaguely remember climbing fences and maybe crossing a creek on some stepping stones, but that's as wild as it got. Here is this year's course map. Nowadays it's known for drawing people from all over the country (maybe even other countries), many of whom dress up in costumes and don't actually run. 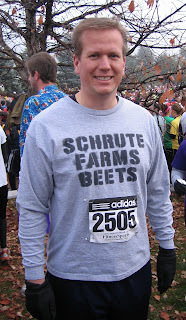 I kept my costume to a minimum, you might recognize the shirt from The Office. 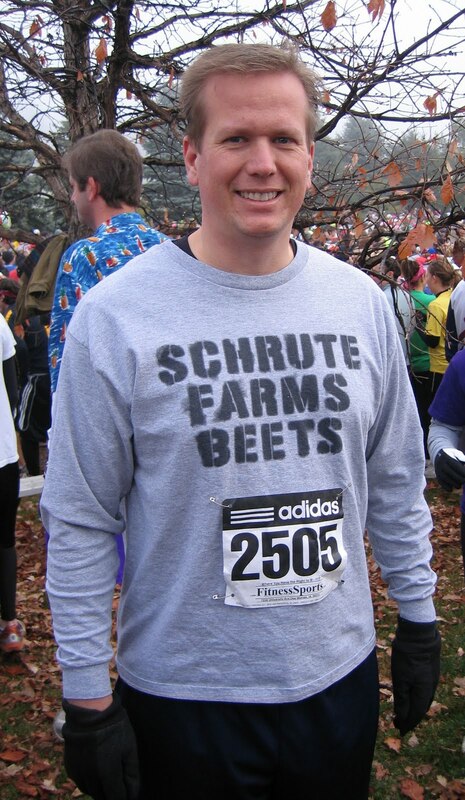 Dwight Schrute wore a similar one in the 5K Fun Run For The Cure. The run is billed as the largest cross country race in the U.S. with over 7000 register racers. I made the mistake of starting at the end of the huge crowd so I spent most of my time passing walkers and "non-racers". It was a really foggy day making for a cold, wet race. Oh, and did I mention it was 40 degrees out? It really was a messy experience with 8-creek crossings where the water was at least knee high (see the video below). We don't have any pictures of me in the back part of the course, but here are some pictures from the Des Moines Register. It really was a fun time, but I just wish I could have run the whole thing, in the end I believe I walked about half a mile just for the bottlenecks. I didn't make this video but it shows you a great example of the experience, you might get motion sickness from watching it. Here is a video of one of the creek crossings. Blake's latest is basketball. He is the fuzzy one in the middle in the white shirt. We don't have any great photos on this sport yet. We have a few more games to get it right. 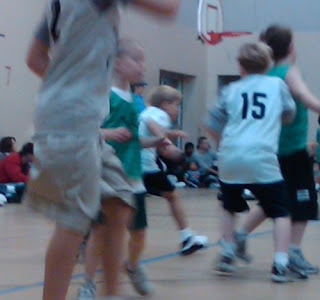 He is loving basketball just like every sport he tries. He still says baseball and wrestling are his "real" sports though. Lately, Hunter and Blake have become die hard Vikings fans. Great news for us, but how they became fans was Brett Favre. This was a little difficult for those of us that have been around for a while. I had to hang a Brett Favre posters on their bedroom wall today. One of their Christmas wishes is to have a Brett Favre jersey. Blake even decorated his Turkey at school to look like Brett Favre. He didn't win the turkey decorating contest, but if the kids were voting he would have. Brett Favre is a Viking, Brett Favre is a Viking. Some day maybe it will sink in. Allen says this beautiful red sky rising promises rain. A New Jerdee on the Way! We have fantastic news! We (Kim and Adam) are expecting a new addition around May 21, 2010. Our first checkup went well. 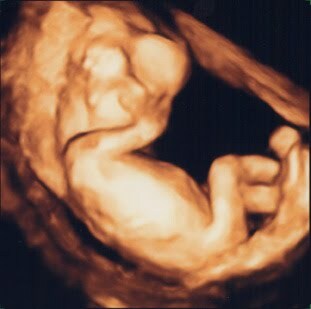 We were entertained when the baby was moving around a lot during the ultrasound; the heartrate was about 162 bpm. We will pass along more details in January when we learn more. 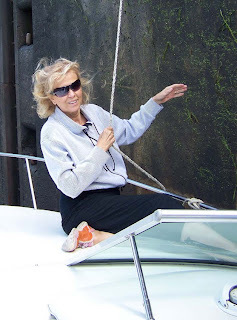 Happy Birthday Mom, Nana, Becky! Hope you're enjoying the good life! In just a few days, we visited many sites--Stanford University where we picknicked after experiencing the Hoover Observation Tower, a "Richardson-Romanesque-with-a-Touch-of-Taco-Bell-Style" campus church, and a garden of Rodin sculptures. That night, Zakk and Jenn came for dinner. Next day, we walked Muir's Woods filled with stunning redwoods near Mill Valley and visited (and picknicked at) Muir's fruit farm/home in Martinez. Then, we were off to Steinbeck country in Salinas where, after visiting the Steinbeck Center, we had lunch in the house where Steinbeck was born. That afternoon was spent on the cliffs of the wild and windy world of Point Lobos. It ended at the Mission San Carlos Borromeo of Carmel-by-the-Sea. The Bill&Solveig Compound in California is a well-crafted world of woods, plants, animals, rocks, and glass. We can see they've spent decades crafting the canyon wall where they live. The latest project was a bump-out in the hall at the front of the house where Bill had just nailed new cedar shakes on the outer wall. We learned about the series of projects underway, those past, and those broken by falling trees and storms. It's hard work living in a canyon but it's a place where they find themselves comfortably at home. On the social end of things, we met many characters from life along Kilkare Road. Becky attended yoga with Lynn and Derek at the Goat Barn on a hill before stopping off for Wine@Nine in the 1930s cabin where Pat lives. Another night (Bill wasn't up for it) was spent down at Bosco's where karaoke was the focus...it was amazing to discover that Sunol singers are doggone talented! We also visited the sites of Zakk & Jenn's wedding--the Water Temple and Sunol's Community Park. On the last two days, we stayed home in the mornings and ventured out to vineyards in the afternoons. By the time we were done, B & S became Wine Club members at Wente Vineyards and Al & I participated in a Wente Wine Club Release Event. Zakk came to dinner that night. Our thanks go out to the California end of the family for treating us like royalty! A Beautiful day for a 5K! This morning, Adam and Blake ran a 5K together. 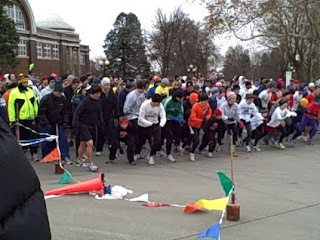 At the start of the race you can see Blake in the white t-shirt in the middle (the short one). 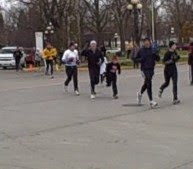 Adam is there, but hard to see behind another runner. Above is Adam in the last stretch, below is Blake. Adam crossed the finish line in 26:03. 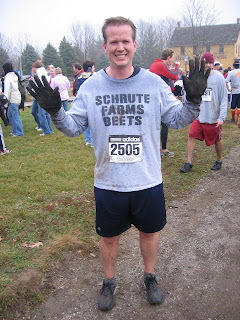 He was the 7th runner in this male 30-39 division. 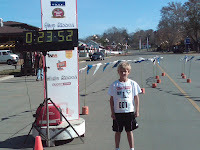 Blake crossed the finish line in 23:52 and was the 5th in his age group of males 19 and under. Those high schoolers sure do have long legs. 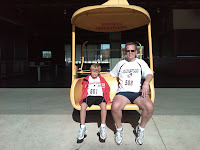 He finished 31st out of all 200+ runners including all ages. Our runners had to stop and take a photo op after the run. 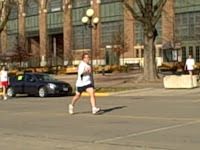 The run was to raise funds for the State Fair grounds improvements. This is the sky ride. 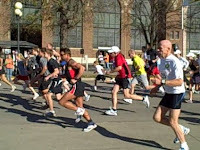 It was a perfect race day with temps around 65 degrees. The first three finishers got ribbons, but since Blake missed that by 2 he got to pick lunch. He chose steak and broccoli at Lone Star. It was candy weekend! The boys braved the low temps and made it around the entire neighborhood ending their evening with a party at the neighbors house until midnight with a Scooby Doo medley. The next day, after the boys sorted out all of the candy that contained nuts and donated them to their parents, we had a ring at our door. A family unfamiliar with Iowan culture was attempting to trick or treat, but had missed the actual Beggar's night. 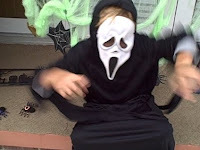 Beggar's night is the night before Halloween when Iowans trick or treat. Hunter and Blake were trying to explain to them that they had missed the night, but struggled with their lack of understanding of English so Hunter just handed over his trick or treat bucket and let them have it. Finally, Sunday was Dia de los Muertos. Amy and Hunter went to the Art Center for the big festival. 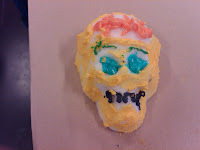 They decorated sugar skulls, sampled Day of the Dead bread and sipped on Mexican Hot Chocolate in the court yard. There was a Mariachi band, dancing, puppet shows and a lot of art to see. We have been having a little trouble understanding why we have to learn Spanish. We saw Hunter's Spanish teacher at the event - points. 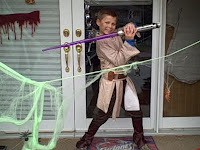 However, I think after giving up his candy because he could not communicate with the Spanish speaking guests at our door helped him see the light a little more. Educational weekend!